There was a feeling of déjà vu and that was normal. But I also felt a bit of personal triumph not just that I had survived for a long spell but that now I could gaze with serenity and contentment at a mighty river that once terrified me. 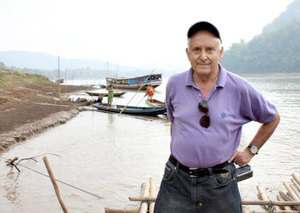 Below the gunwale, the muddy waters of the Mekong flowed slowly in front of my eyes. Forty-two years had passed since I watched them in Vietnam where, as a young war correspondent, I had gone to cover a war that left a sorrowful mark on American history. Now I was way upriver, in Laos, the very country where the Ho Chi Minh trail fueled the communist war in South Vietnam, no matter how many hundreds of thousands of bombs were dropped in the jungle by the U.S. armed forces. I reflected on war and peace, and the 42 years in between as I reclined on a comfortable deck chair on a sleek tourist boat going upstream from Luang Prabang, the old capital of Laos. Forty-two years ago I was on an Alpha boat, in helmet and flak vest, balancing myself on a 50-caliber machine gun. The river patrol boats were fast, but their hulls of fiberglass and aluminum were vulnerable to enemy fire. A hit by a North Vietnamese RPG-2 would devastate the craft and its four-man crew. Besides patrolling the river and its canals, inspecting suspicious sampans and other small boats, the Alpha boats were employed as decoys to draw fire from the shore thereby revealing the location of enemy forces. The attack helicopters were just a radio call away. Knowing that my Alpha boat was a target of opportunity made me very nervous. To be young and to take risks go hand in hand. War can be frightening and exciting at the same time. When peace comes, it is a fast-changing game. The Mekong delta was then and still is the most populous region in Vietnam. More than 40 years ago, its waterways were the only avenues of transportation. The region is still the rice bowl of Vietnam, but now there are roads and even a bridge, opened last year over a tributary river, that connects Can Tho to the Vinh Long province. Aquaculture has come to the delta in a big way, and its catfish and shrimp are exported in great quantities. The farmed shrimp in particular are a popular food on American tables. The makeshift ferries of the past have given way to bigger, more powerful boats that ply the river. The Mekong is much more than a provider of survival food, it is the source of wealth. Today’s American visitors don’t carry weapons and wear helmets, but cameras and baseball caps. In Vietnam, the Mekong is known as “the river of the nine dragons” while Burma, Thailand and Laos call it “Kong, mother of waters.” It is the 10th longest river in the world, 3,050 miles in all. It rises in Tibet and flows through China and then forms the boundary between Myanmar and Laos and, further south, between Laos and Thailand. Finally, it passes through central Cambodia and southern Vietnam before draining into the South China Sea. Laos, a landlocked country, is home to the greatest share of the Mekong. This is a country that depends on the river like no other. In the north the river is still the only route through mountains. It is navigable from the Cambodian border all the way to Honayxay, 920 miles upstream. The Hmong tribes live in bamboo huts in villages hidden by the banks of the Mekong. Their agriculture yields subsistence crops and their fishing is threatened by changes in the river that are in large part attributable to the three dams — soon to be followed by other ones — that China has built in blatant disregard of the needs of populations downstream. The Hmong are improperly referred to as Montagnards, a name coined during the French colonial era and used by the Americans who found them willing allies in the war against the communists. The forests, of course, are a great resource, but the Laotian government has taken measures to stop wanton deforestation, unlike Vietnam where the forest cover has been reduced by 50 percent to expand agriculture. I cannot help but think back to the time when one of the priorities of American forces in Vietnam was to destroy the forest canopy with bombs, napalm and the nefarious Agent Orange. The Mekong usually rises more than 30 feet in the rainy season, but the danger is that the water levels are going down in what they call “the sea of Laos.” Navigating it can be tricky. With more than passing interest I watch the young pilot of my boat skirt rocks in the middle of the river. There are no canals where the boat could venture in to pursue Viet Cong. Just sandy banks and steep hillsides and below the villages a small fleet of flat-bottomed riverboats used for fishing and transportation. The traditional outboards use a type of propulsion that throws a wide rooster tail. They reminded me of similarly powered boats that I saw in the Vietnamese delta, built with wood, flat bottomed with shovel fronts. But now the boats are getting bigger even in Laos and fiberglass is replacing wood. I am told that in Can Tho, the main town on the delta where I stayed during the war, one can see quays with heavy ocean-going fishing vessels. The waters are indeed the same, brown but not muddy, deceptively calm and welcoming. The current is there, powerful and perilous, so much so that it took us two hours to go upstream to the Pak Ou caves from Luang Prabang and only one hour to get back. The caves are a treasure trove of Buddha statues and statuettes. No fewer than 4,000 of them are scattered around two caves that look like gaping holes in the sheer limestone cliff. People come up here to pray but nowadays they are overwhelmed by the tourists, most of them Thais. Long isolated from the rest of South East Asia, Luang Prabang is undergoing a renaissance. Named a World Heritage site by UNESCO in 1995, it has blossomed into a tourism center endowed with golden temples, stunning reliefs and picturesque promenades. The royal palace, where the king resided until 1975, has been preserved as a charming jewel at the crossroads of history and religion. After the king was dethroned by the Pathet Lao, the royal family was taken away and subsequently vanished. The same Pathet Lao has somehow changed its feathers and is now part of a unique form of government that is basically a communist “people’s democracy” but retains the social architecture of the Buddhist past with old and new dominant elites. Like all Asian markets, the street markets in Luang Prabang are a pleasure to walk through. There is plenty of fish from the Mekong: the giant river carp, the stingrays and catfish can be 10 feet long. At night, another market opens its stalls, overflowing with gorgeous silk garments and dainty products of the local cottage industry. Monks in robes of an earthen red tone populate the monasteries and retreats in the area and can be seen in the streets in the morning, asking for alms and receiving offerings of rice and fruit. A conspicuous number of rest houses, some of them quite elegant, flank the long promenade along the Nam Khan River that empties into the Mekong just below the town. Everywhere, the banks of the two rivers abound with terraces overflowing with greenery, vegetables, and corn. Peanut bushes grow even in the sand. It is a peaceful sight in an enchanting place. Almost unconsciously, my mind goes back for a moment to the time when I was trying to get some sleep aboard the support ship USS Benewah, in the Mekong delta, over the din and deafening noises of operations, from whirring helicopters to the roar of the diesel engines of the Alpha boats and the heavy armored Monitors, and explosions not far removed. I compare that to the gentle sound of temple bells at dawn in Luang Prabang. Almost by magic that sound finally replaces the memory of a war on the same Mekong that I witnessed long ago.